When it comes to fresh, meaty tuna, it's best to keep things simple. Throw it on the grill, serve it with a flavorful sauce or side—dinner is ready in no time. Here, 10 superfast and delicious grilled tuna dishes to make this summer. Fresh mint blends with garlic, vinegar and sugar for a room-temperature sweet-and-sour sauce that's perfect for a full-flavored fish like tuna. Serve the rather forceful sauce separately so that each person can decide how much or little to use. Make sure to double this recipe—the leftovers are incredible flaked and turned into a salad for sandwiches. The pepper sauce in this recipe is puréed with potato and is almost hearty enough to be a side dish. 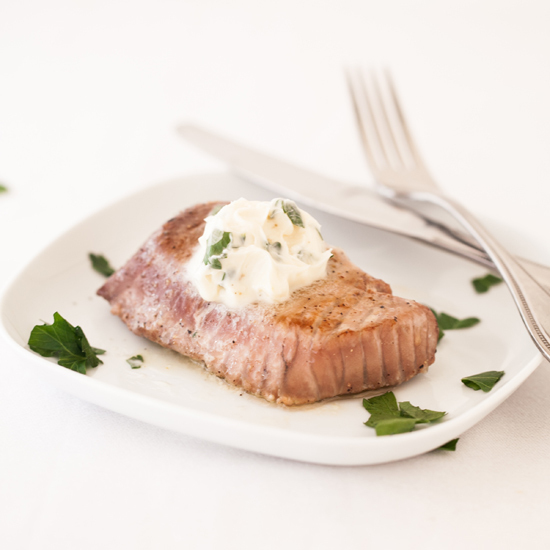 Few meals are quicker to put together than this—grilled fish steaks topped with a simple compound butter. For even faster preparation, make the butter ahead of time and store it in the freezer until ready to use. The anchovy flavor here is quite mild; add more anchovy paste to suit your taste. The quick sauce in this recipe has a pleasant tartness, which balances the richness of the fish. This spicy Japanese-style salad gets its kick from wasabi. Steamed jasmine rice or couscous would make a nice accompaniment to the tangy citrus sauce on the tuna. Here, tuna steaks get marinated in sesame seeds and any number of fresh herbs before getting seared on the grill. You can add a smoky flavor to the Catalan sauce by swapping in smoked almonds for the usual plain kind and adding a touch of pimentón de la Vera (powdered, smoked Spanish red peppers).